Container planting has always been my favorite aspect of gardening. I love the temporary nature, the playfulness and the ability to experiment and break some “rules”. And I don’t limit myself to terra cotta pots and planters – I always mix in some unusual vessels too. And thanks to my obsession with affection for flea markets, I’ve amassed a fair share of boxes, baskets and other assorted items that are just begging to be planted up with pretty blooms. 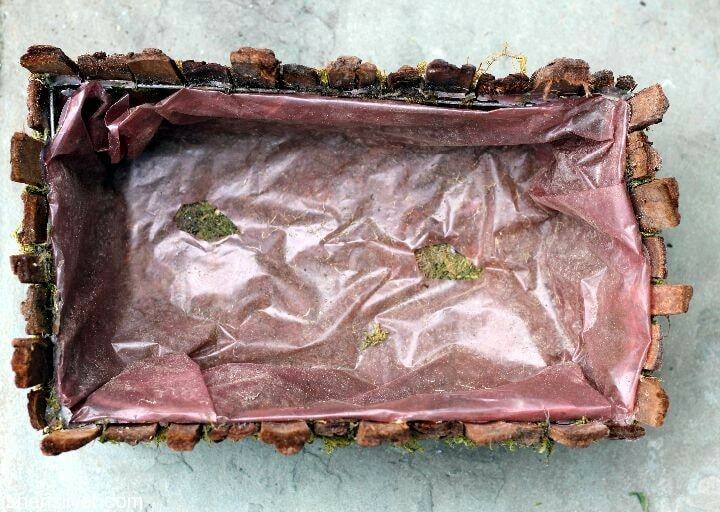 You’ll need to do a little extra prep to make sure that: a) your plants thrive in their unique home, and b) you protect the container from water damage. Here’s what you need to know to plant up just about anything you can think of! Drainage. I learned the hard way that if you don’t allow for proper drainage, your plants will get water logged and eventually rot and die. There are two ways to do this. 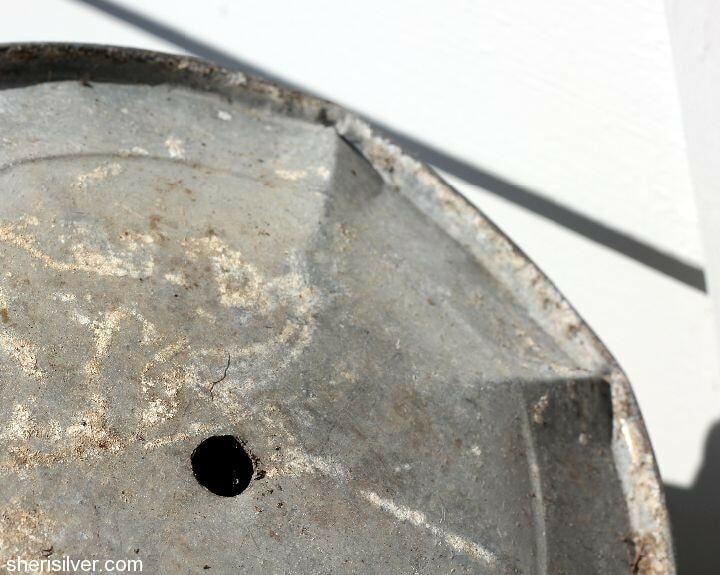 To prepare this watering can I simply drilled a hole in the bottom – that was all that was needed, and I was ready to plant it up! There were no drainage holes and I obviously didn’t want to drill into this beloved piece. So I put a layer of gravel on the bottom of the liner and placed the plants on top. I knew right away that I wanted to fill it with herbs and flowers – but I wanted to make sure that I protected it in case I decided to use it for another purpose down the road. I used a heavy duty trash bag to line the bottom and sides (stapled in spots to keep it secure), and poked a few holes in the bottom for drainage. This little basket also may have life as something other than a planter – in the meanwhile I’ve lined it with plastic to keep it safe. It originally held three little pots – which got crushed in one of our lovely storms this past winter. I was going to get replacement pots but decided to plant directly in it instead. 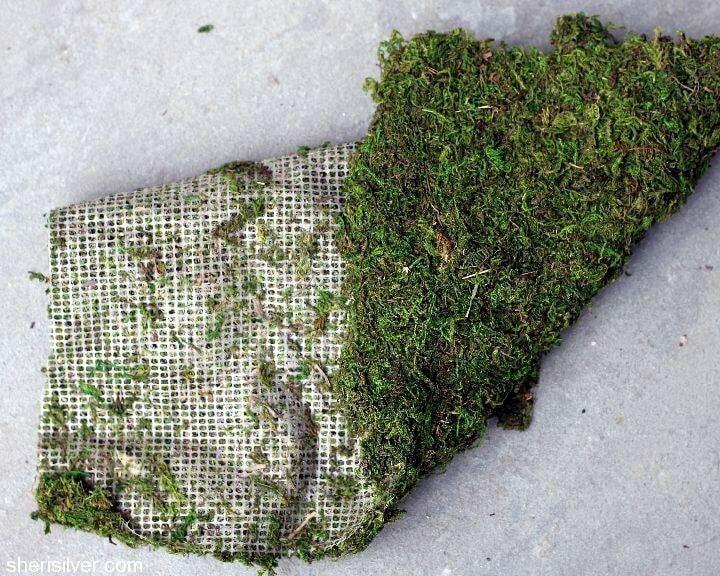 I lined the whole thing with sheet moss, and placed a plastic bag in the bottom to ensure that no soil would spill out. 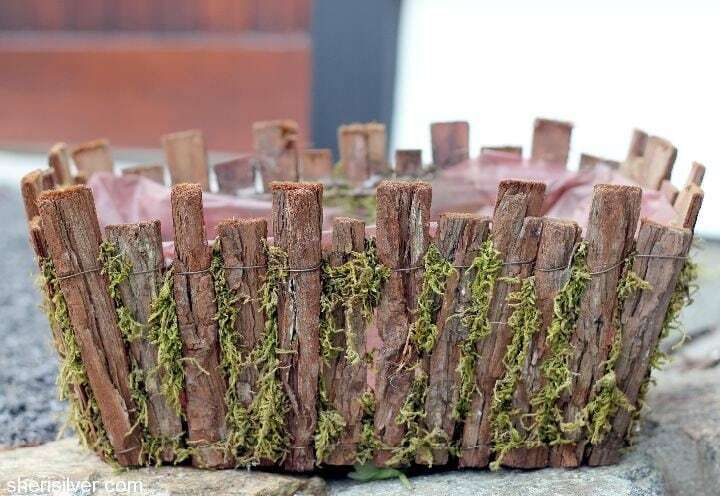 One of my favorite finds is a moss mat – it comes in rolls, can be cut to size and is backed with plastic, so there’s no need for additional lining! Think scale. The plants you select should be compatible in size with their container. A petite vessel will look best with plants that are on the small size – choose varieties that are short in stature, or have tiny or delicate blooms. Think weight. As in, soil. 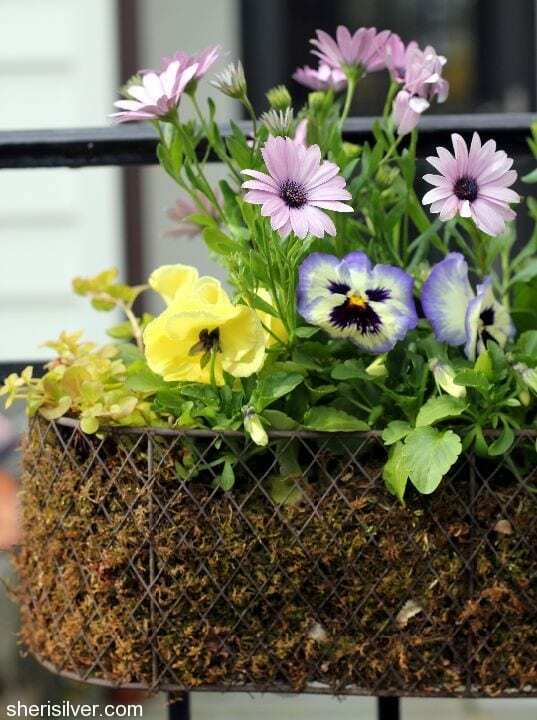 No need to fill your containers – especially the big ones – with soil from top to bottom. It’s expensive, wasteful and heavy! Fill up one-half to two-thirds with lightweight “filler” – like packing peanuts or the small plastic containers from your plants. 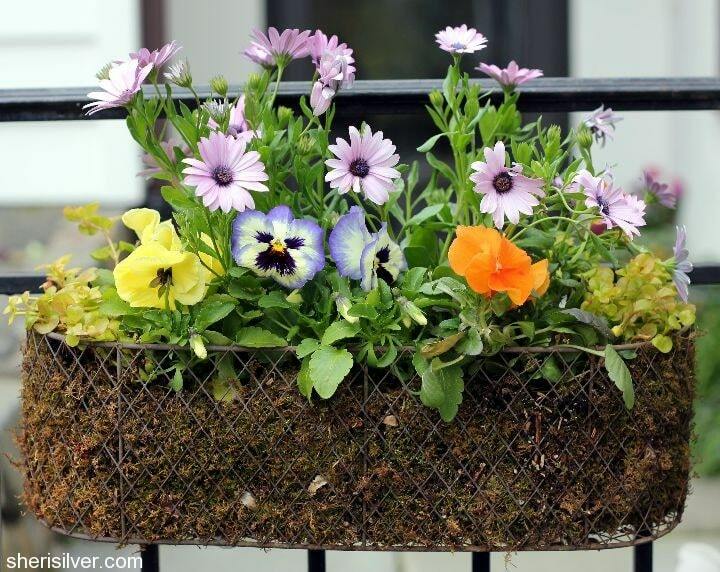 Fill the rest with your potting soil and place the plants on top. Think style. 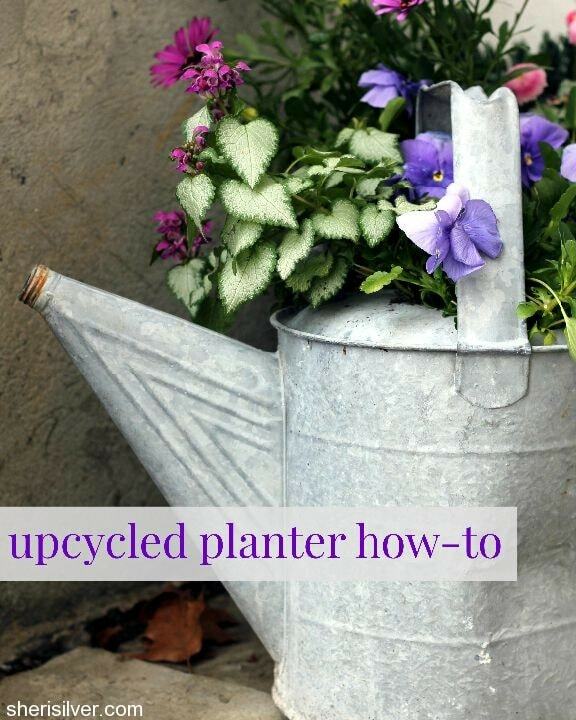 A wicker bicycle basket, old boot or wheelbarrow will shine with an overflow of loose, cottage-y plants. 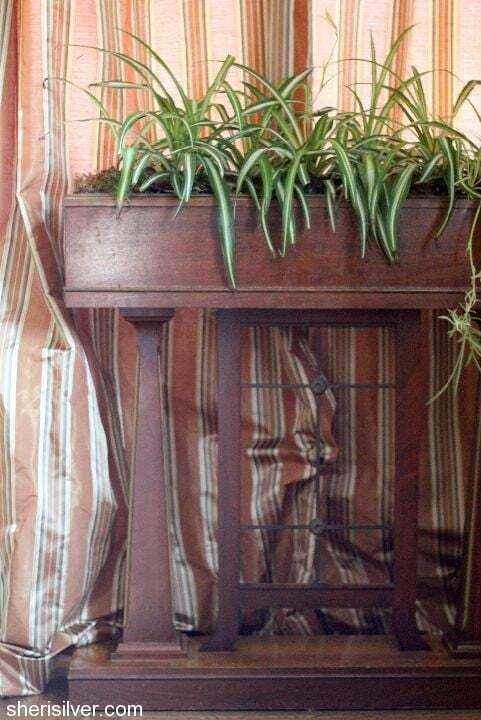 On the other hand planters with simple, clean lines look great potted up with succulents and grasses. Think color. Take a cue from the colors of your container when selecting your plants. 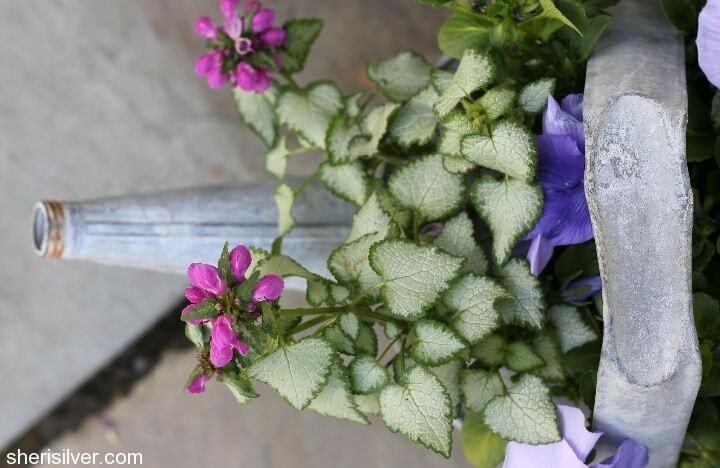 In the watering can above, I chose the silvery leaves of the lamium to pick up the color of the can. And the cool purple flowers – of the lamium as well as the pansies – provide a chic contrast. 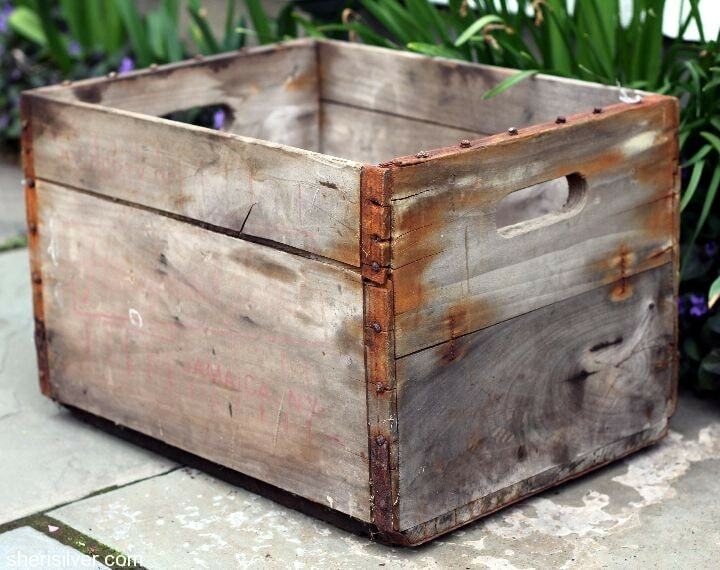 And remember that container gardening should be fun! Experiment with new plants and combinations, and don’t limit yourself to plain terra cotta pots! Hey Sheri – Thanks for the tips. I love these types of planters on my door step. They make me happy when I walk up to the door!